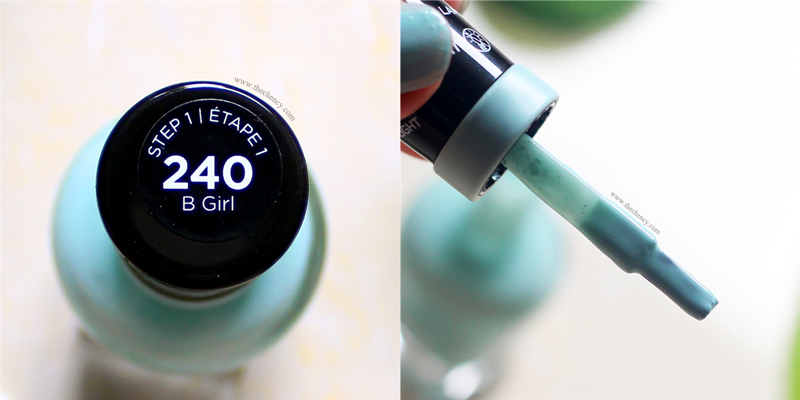 #240 B Girl is a baby turquoise; fun and pale but not wash-off color. This color is suitable especially in spring time. :) It has about 80% opaque color payoff for the first layer. It takes full coverage for the second layer. The brush bristle was thick and flat which was my personal ideal design where I can easily apply under my control even the side of nails. Somehow, try be careful with force when applying because it can easily create strokes. The texture is thick but the application are smooth and evenly. Like what I mentioned just now, the formula doesn't required UV/LED light to dry. It dries moderately fast (slightly longer than normal nail polish will do before continue with another layer). The scent was not pleasantable just like normal nail polish, so I have nothing to complain about, lol. For gel mani, there's a must of using Sally Hansen Miracle Gel Top Coat. 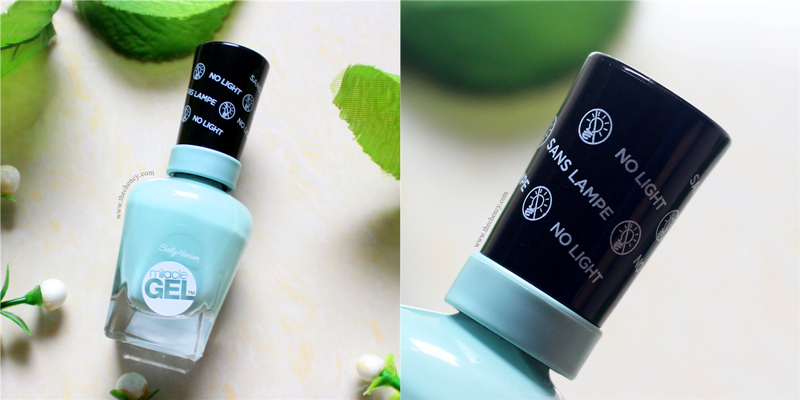 If you're asking if normal top coat will get gel effect, I could said the result was like normal nail polish with better long lasting formula. By using Sally Hansen Gel Top Coat, my nails were actually still shiny just like day 1, which really impressed me! My mani ended up to three weeks. Please do attention that my nails always can lasting better than normal nails and the result might be vary if on normal nails. I have some minimal chipped at the end but nothing much problem for me. :) It's can be removed by using normal nail remover and I am using Sally Hansen Extra Strength Nail Polish Remover to removed.